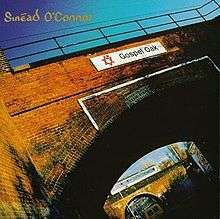 Gospel Oak is an EP by Irish singer Sinéad O'Connor. The album sold 250,000 worldwide. The cover photograph of the album shows the two brick skew arch bridges adjacent to Gospel Oak railway station in north London. The UK release contained only the first four tracks. ↑ Christgau, Robert. "CG: Sinéad O'Connor". Robert Christgau. ↑ "Sinéad O'Connor – Gospel Oak EP". Discogs. Retrieved 4 January 2013.